In the fight against Neglected Tropical Diseases (NTDs), it has become obvious that learning from other countries’ successes will help many others to control and eliminate these diseases. This is how the China-Africa meeting and collaboration came about in 2012. Whilst on a visit to the Liverpool School of Tropical Medicine, we caught up with Prof. Louis-Albert Tchuem Tchuenté regarding the China-Africa Meeting on Schistosomiasis Elimination and Training Course on Malacology, organised in Cameroon from the 24 – 28 October 2016. Prof. Louis-Albert Tchuem-Tchuenté is an NTD Ambassador for Liverpool School of Tropical Medicine. He also heads the Centre for Schistosomiasis & Parasitology in Cameroon and is a professor of parasitology. He lectures at the University of Yaoundé I and is Country Director for the COUNTDOWN project in Cameroon. 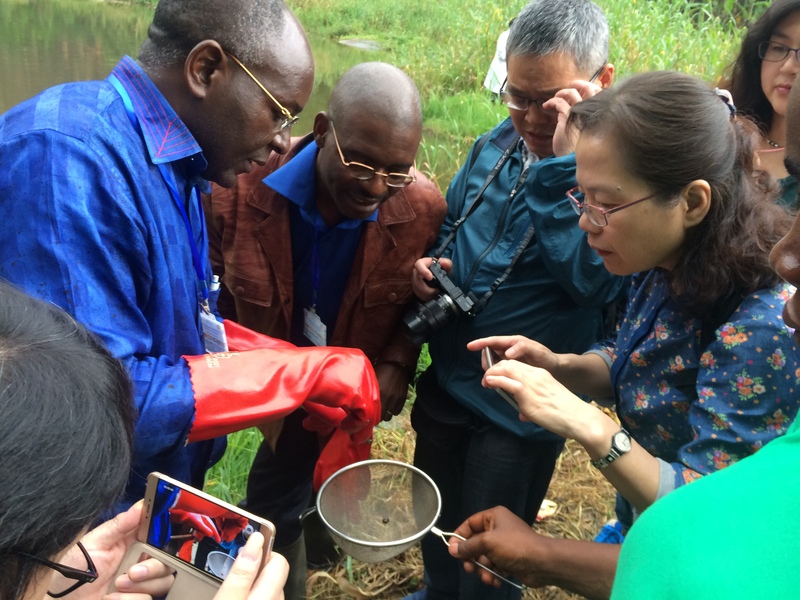 His expertise in Schistosomiasis and Soil-Transmitted Helminthiasis spans over 30 years. He is Cameroon’s National Coordinator for the control of Schistosomiasis and Intestinal Worms. Discussions with Prof. Louis-Albert revealed that this China-Africa meeting started a long time ago. Given that China has a vast amount of experience in Schisto control and has successfully eliminated Schisto in many of their provinces; many African countries still struggling with schisto can learn from the Chinese experience. Very few areas have Schisto in China and Schisto has been eliminated as a public health problem there. The highest prevalence is probably 1-2 percent and the plan now is to interrupt the transmission everywhere. According to Prof. Louis-Albert, China invested a lot on their elimination agenda including treatment, environmental modification and snail control. Most of the schistosomiasis cases in China are zoonotic because they have a lot of animals who act as reservoir hosts. That is why they have invested a lot of money to modify the environment so that the animals do not maintain the parasite life-cycle. One of the highest components of this is the snail control. Schistosomiasis has two main hosts: vertebrate hosts (including human beings and animals) and the snails. In the transmission, you have both factors that make this happen. The snails are in the water and if you don’t change the environment, the snails remain present. Even if you reduce the transmission, then at some stage it just needs one person who is infected to defecate or urinate into the environment, to rebuild the transmission cycle. That is why it is very important to control the snails. The Chinese have done so successfully and have vast experience in snail control. Based on this, it became important for African countries to benefit from the Chinese experience. That is why the World Health Organisation(WHO), together with the Chinese government, decided to have this China-Africa cooperation, for the elimination of schistosomiasis in Africa. This began at the governmental level between China, WHO and the governments in Africa. The agenda was further discussed at the China-Health Ministerial Forum that reviews valuable health development issues. During the 2013 Minister’s Forum held in Beijing, an agreement was reached on this partnership and the initiative approved. This move was necessary to progress granted things take time at the government level. That is why the China team, WHO and African governments decided to start an institutional-based cooperation. This initiative was developed to sustain a China – Africa Cooperation for Schistosomiasis Elimination. China has several provinces that are endemic for schistosomiasis and it was important to link these provinces to different African countries depending on the relationship they have. That is why in the first phase, ten countries were selected in Africa and were linked with different provinces in China. The first meeting to set-up the institution-based cooperation was launched in 2015, in Malawi. The meeting launched the initiative and the memorandum of understanding between the partners. The memorandum was signed between different African institutions and Chinese institutions for research. The meeting in Cameroon was the second meeting and it was focused on snail and malacology training. Another component of the training was using mollusciciding to control the snails. The Chinese team and ten countries participated in the meeting in Cameroon. The rationale for collaboration is clear as it fosters relationships between various actors and allows in-depth knowledge of what works in practice. This knowledge gets refined for better use through creating more cost-effective solutions which are sustainable in the long term for NTD control and elimination.